PETA is rounding up healthy community cats and kittens and taking them to the police-run pound to be killed. One of 22 records of cats and kittens surrendered to VBAS by PETA in 2015. 17 of the 22 were killed, the vast majority immediately on intake despite being kittens and very young cats, in good health, and entitled to a mandatory five-day hold. For example, PETA says it sent Peninsula Regional Animal Center seven dogs and 27 cats, but PRAC filed its own report stating it did not take in any animals from any other releasing agency, which includes PETA. 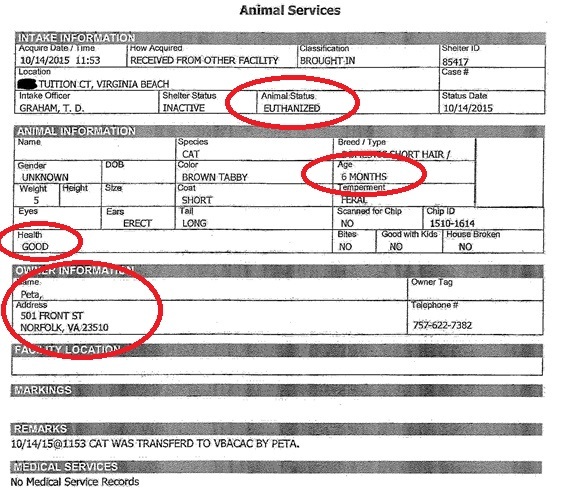 Likewise, while PETA claims it sent 70 cats, 22 dogs, and two “other companion animals” to the Norfolk Animal Care Center, Norfolk reports taking in only 61 cats, 31 dogs, and two “other companion animals” from Chesapeake Animal Control and Virginia Beach Animal Control. It does not report taking in any from PETA. when PETA goes out on calls about community cats, they require people who call to sign a form giving PETA “permission” to take the cats. What these people sometimes do not know and what PETA does not tell them is that it is a surrender form, giving PETA the excuse they want to kill the cats right away without a holding period. (Since these cats are legally classified as “strays,” however, neither PETA nor the person signing the form have the legal ability to treat them as “surrendered.”) Are these animals then being sent to [other shelters] as “owner surrenders” who are then killed, while PETA claims them as “live releases”? It looks like, at least as it relates to the Virginia Beach Police Department’s Animal Shelter (VBAS), that is what is happening to the cats, though it does not explain the misreporting as VBAS properly logs them in as “PETA transfers.” Nonetheless, cats are being killed that PETA is claiming as “live releases,” community cats who are entitled to a legally mandated holding period are being killed on intake, cats in good health are being killed, including kittens as young as six to eight weeks old, no cats are being scanned for microchips before being killed, none are being afforded any medical care, the forms are being altered, and the numbers still don’t add up. Although PETA claims to have sent 29 cats and 1 dog to VBAS in 2015, VBAS reports only 22 cats (and no dogs) surrendered by PETA. 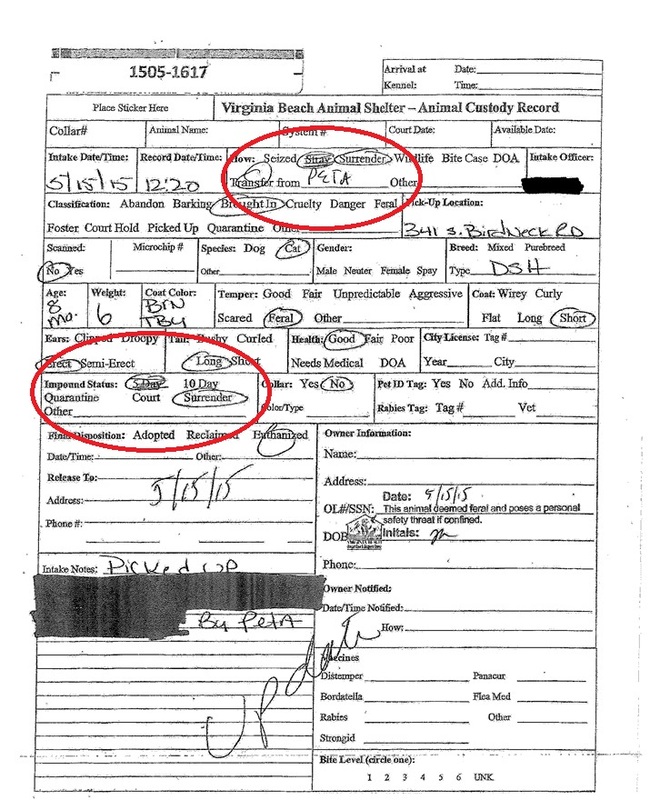 We do not know what happened to the dog or the other seven cats, but we do know what happened to the 22 cats PETA brought to them and logged as “live releases”: 17 of the 22, or 77%, were killed. At VBAS, only four were transferred to rescue and only one was adopted. Of the 17 who were killed, 11 were in “good” health, two were listed as “fair” (for being “thin”), and four were listed in “poor” health. Among those killed were community cats as young as six weeks old, two six-month old kittens in “good” health, an eight-month old kitten in “good” health, and a 10-month old also described in “good” health. Eleven of the 17 cats killed were one year old or younger, five were between two and three years old, and the oldest was only six years old. In other words, all of them had a full and rich life ahead of them, but, thanks to PETA and its henchmen at the Virginia Beach Police Department, all are now dead. Rather than feed the “thin” cats, socialize the kittens, and neuter and release the true “ferals,” they were killed out of convenience and often the very day they were taken in. Of the 19 animals killed, nine were killed on the day they were taken in, four were killed within 24 hours. Only four were given a couple of days, presumably because there was no one to kill them over the weekend, but none were held for the five-day holding period. Even the four eight week old kittens listed in “poor” condition are suspect. They were afforded no medical intervention, no tests, no real evaluations beyond a cursory visual exam. In fact, none of the cats killed, without exception, were given any medical care whatsoever. And none were scanned for microchips, including the ones listed simply as “scared,” although conceivably they could have been someone’s lost cat. Instead, PETA turned them in as “owner surrenders” and VBAS plunged a needle full of poison into them, exactly what PETA knew and wanted to happen to them. 4 listed in “poor” health. None were held for the Virginia mandated five-day holding period. Indeed, several of them were initially marked as a “5 day” hold and then killed that very day. At some point, the form was altered to change their status to owner “surrender” to justify the killing on intake. None were scanned for a microchip. PETA listed all these cats as “live releases,” while knowingly delivering the vast majority to their deaths. PETA, where are the missing animals?